You are in the 92nd percentile of all brackets with 24 of 32 correct picks if you used one of our four brackets posted before the tournament based on; 1) Value Add/Kenpom/injuries, 2) All-American/Top 3 Value Add Players, 3) Upset only if lower seed within a point of Value Add, or 4) Hottest teams. 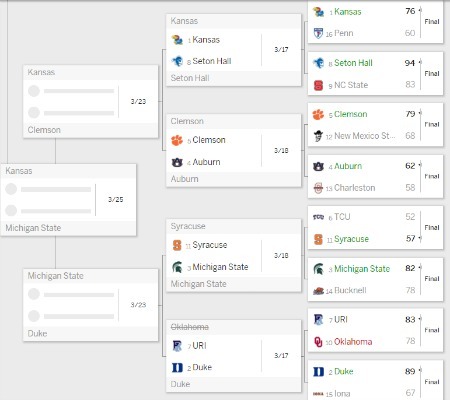 Of these, the bracket that went with the best Value Add of healthy players and limited upset picks to when the worse seed was within a point in Value Add of the favorite is the best with the potential for up to 1580 points in the ESPN leaders list. 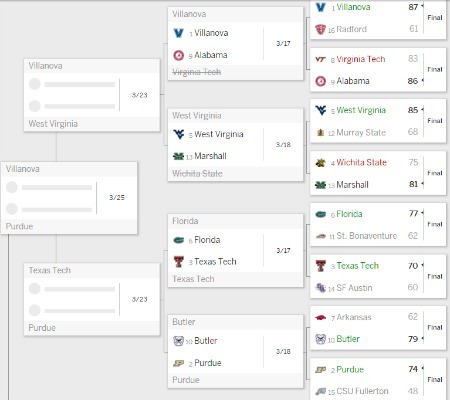 This is because, despite Virginia's loss, the other 15 Sweet 16 teams, seven Elite 8 teams, and three Final Four teams are all alive (see all picks below from the prediction post before the tournament. If you went with the bracket that adjusted for the experience of the team's guards, then you are only one worse with 23 of 32 correct to place in the 81st percentile. However, if you were lazy and just went with the first "composite" bracket or based on the most NBA talent, then you are just below average with 21 correct picks for the 43rd percentile. 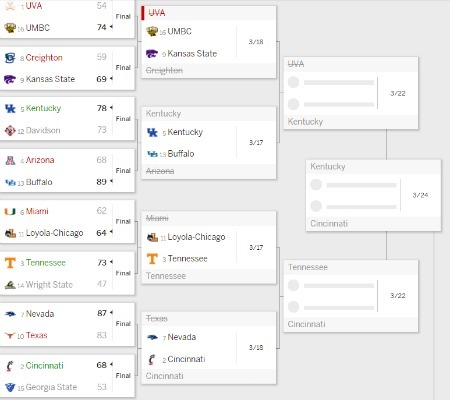 The two bad brackets this year were the one based on teams pulling upsets if they had a mismatch (20 correct for 28th percentile) and the bracket that relied on the most experienced coaches to pull off close upsets (19 correct for 17th percentile). 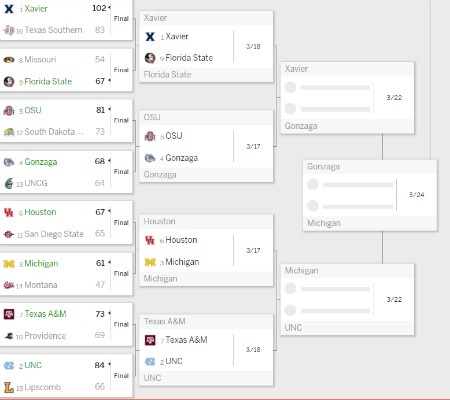 All that being said, the best bracket I saw was from my Director of Scheduling, who started my day by saying, "I didn't pick Seton Hall because I had never heard of them, but I had the others right." Sure enough, I looked at her bracket and she was 15-1 despite only watching youth basketball games with her son this year :-) I will figure out her system next year.